Built by Baldwin Locomotive Works in 1907, the oil burning 4-6-0 first served on the Nevada-California-Oregon Railway as the second number 4 on that line. 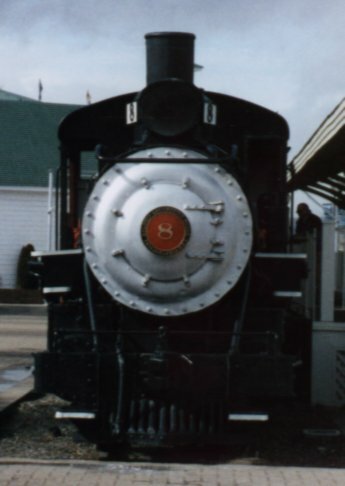 Around 1909, the locomotive was renumbered to number 8, again the second engine to wear that number on the N-C-O. The engine served until the N-C-O was taken over by the Southern Pacific in 1926. Following a major overhaul at the Sparks railroad shops in 1930, No. 8 was put to work hauling mixed freight and passenger trains over track that was once part of the Carson & Colorado. Little by little, portions of the SP&apos;s last three-foot gauge were taken up until all that remained was a 70 mile long segment between Laws and Keeler. With the purchase of a narrow gauge diesel locomotive in 1955, which replaced two of the three remaining steam engines, No. 8 was formally presented to the State of Nevada by the Southern Pacific on September 18, 1955. In accepting the ten-wheeler from Assistant General Manager W. D. Lamprecht, Governor Charles H. Russell announced that the Nevada State Museum would serve as custodian of the veteran iron horse. At that time, the museum was in the middle of a building program with no space to display the gift. For nine years, the 4-6-0 monopolized the tree-lined front yard of Roy Boswell's Eagle Territory Museum at 310 Mountain St. in Carson City. By 1964, the year of Nevada's Centennial, a new home was found for No. 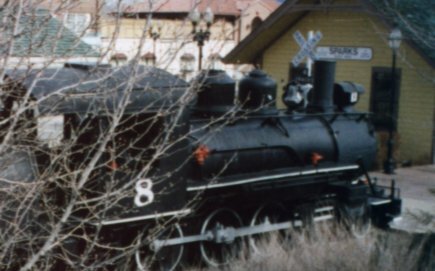 8 next to the Post Office (now the Nevada State Library). Not wishing to be left at the gate amid a country wide flurry to commemorate this nation's Bicentennial, the City of Sparks negotiated successfully with the State Museum in 1975 for a long-term loan of the engine at their planned park on "B" street (now Victorian Avenue). Since July of 1975, No. 8 has attracted many tourists and railfans to the Bicentennial Park where it heads up a static display of standard-gauge railroad equipment.